With under a week left before the 2019 Nedbank IMC Conference kicks off on 14 March 2019, it is set to be the biggest IMC conference to date with over 600 delegates attending. "We are very excited to be welcoming so many industry players and specialists under one roof. The event was sold out over a month ago which shows us that people are really keen for robust conversation around stripping marketing down to the bottom line" says Dale Hefer, CEO of the IMC Academy. IMC and their naming sponsor, Nedbank, aren’t stopping there. Both IMC and Nedbank’s mission is to uplift the youth and make events like the conference accessible to young people in the industry and in business who are wanting to know more. “With this in mind, Nedbank will be streaming the conference live on our Facebook page and we are encouraging young people at colleges and marketing teams across the country to host “Watch Party’s” on the day,” says Khensani Nobanda, Group Executive: Nedbank Group Marketing and Corporate Affairs. 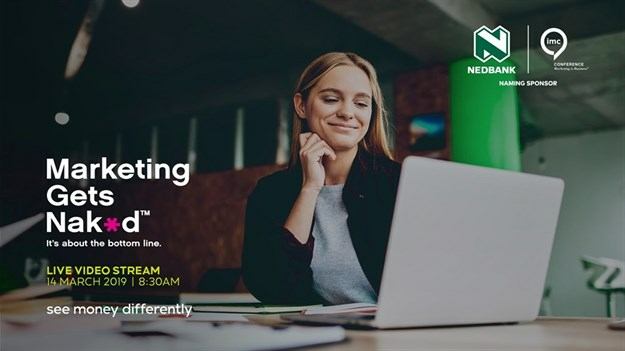 To host a live “Watch Party” simply visit the Nedbank Facebook page and click “Interested” on the #NedbankIMC2019 event. You’ll get a reminder to tune in on 14 March 2019 and when the event is about to start on the day. Wait for the broadcast to start, then click “Share” and “Start Watch Party” from within the feed. This is the first time the IMC Conference has offered this kind of online accessibility. “By hosting a “Watch Party” on the day, you’ll have full access to the line-up of 20 industry experts sharing key insights right from your phone, PC or smart TV. You’ll also be able to interact with other live video viewers as you watch the content together in real time – and even stand a chance of winning a return flight with Kulula” adds Dale. To host a Facebook “Watch Party” or to host a “Watch Party” directly on your Facebook Page or Group, go to https://www.facebook.com/help/1681245065258554?helpref=uf_permalink for more information.